This must come as no surprise, after the highlight from last week that dossier author Christopher Steele was forwarding information to the FBI through top Justice Department official Bruce Ohr as late as May 2017. Although Steele’s role as a confidential informant for the FBI had been terminated on 1 November 2016, because of Steele’s misconduct in leaking information to the media, the FBI continued to accept data from him well into the Trump administration. FBI personnel documented this information flow in a series of interview records, or FD-302s, recounting what Bruce Ohr passed on from Steele. The flow of information stopped – at least according to the 302 record – only when James Comey was fired as FBI director, and Robert Mueller was appointed to investigate “Russian meddling” in the 2016 election on 17 May 2017. At the most basic level, that means the FBI was no longer the main place to funnel paid-for oppo research on Trump. It cannot be meaningless that the moment that condition changed, the Ohr 302s dried up. Now John Solomon has reported at The Hill that the next obvious step did, apparently, occur. Christopher Steele, in a series of communications with Ohr, made a very persistent attempt in the summer and fall of 2017 to become a source for the Mueller probe. Months after being dismissed from the FBI’s Russia probe for misconduct, British intelligence operative Christopher Steele discussed being reinstated with a senior official working for Deputy Attorney General Rod Rosenstein, so Steele could assist special counsel Robert Mueller. [T]he text messages are the first indication of an apparent effort to get Steele restored to good graces with the FBI and, possibly, to have him assist Mueller, an effort that appeared to surface as a serious idea in July 2017. Indeed, the first overt and specific reference to this effort occurs in a text on 16 July 2017. But there is actually an earlier reference to “reengagement.” In context, it is clear that it refers to reengagement in Steele’s role as a confidential informant on anti-Trump material. That message was sent on 22 June 2017. And it implies that Steele and Ohr had discussed the matter before 22 June. Solomon has screen caps of a lengthy series of texts surrounding this timeframe. But it is clear just from this snap that Steele and Ohr discussed the Comey resignation as a significant event the day it happened (9 May on the U.S. East coast). The dates of the Ohr 302s in May 2017 – 8, 12, and 15 May – comport with the evidence of communication during this period. Then Mueller was appointed on 17 May. 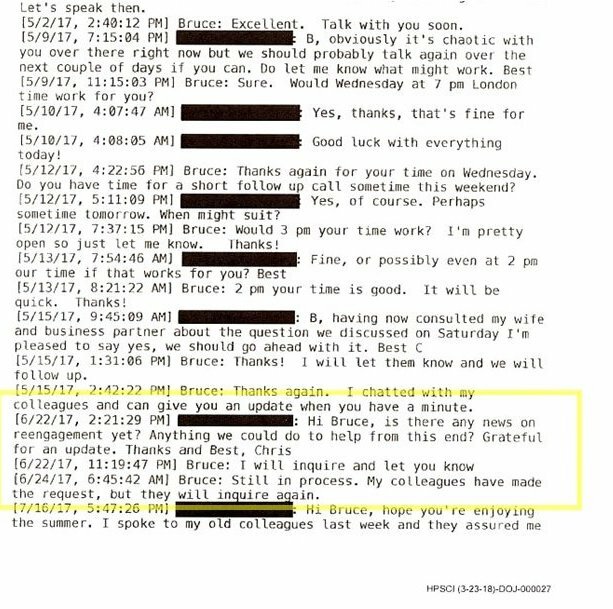 And on 22 June, Steele was pressing Ohr on the question of “reengagement,” which apparently was something they had already discussed. That means that in the very earliest period of the Mueller probe – while Mueller was assembling his staff and putting together his plan, and before there were reliable public details about where he was going with it – Steele was anxious to get back in. There are a few crucial observations to make about all this. One is hinted at by Steele’s “we” on 6 August. Although it may refer merely to the implied common interests of Steele and the Mueller probe, it’s an ambiguous formulation. To my ear, it refers equally to Steele as part of another “we,” which probably included his anonymous funders through Fusion GPS (i.e., the donors to the Penn Quarter Group project run by former Feinstein staffer Daniel Jones; see top link). And very possibly the shadowy circle of interests in the UK that have kept popping up in connection with Steele, his dossier, several other prominent characters in the drama, and John Brennan. The significance of that “we” in this case is that they — i.e., the “we” — very much wanted to inject information into the Mueller probe. But that raises a second, critical observation. The pressure through Steele and Ohr wasn’t making that happen. One way to interpret that would be to merely assume Mueller was playing this by the book. However, there have been plenty of reasons to conclude that he is pretty selective about when he plays things by the book. Besides casting an investigative net so vast as to negate all pretense of legitimacy – e.g., just for starters, running down random events outside his special-counsel charter in Qatar and other non-Russia nations, and pursuing alleged payments to prostitutes from more than a decade ago. None of which has a relation to Russian collusion in 2016 – he has been willing to benefit from possible abuses of prosecutorial powers in tangentially linked but substantively unrelated cases. Mueller’s record of acting in the spirit of constitutional restraint is unimpressive. I don’t think we need to confine ourselves to the assumption that integrity is why Steele wasn’t able to break into Mueller’s information circle between June and November 2017. And if it’s not due to integrity, that’s a big clue about the meta-narrative of Russiagate. The “Manafort” thread is getting top billing regarding Mueller’s legal proceedings. But although the Steele dossier specifically fingered Manafort as a Russia-Trump principal (indeed, did so in laughably crude, reductionist language), and is what made Manafort famous to the public and the political debate, the “Steele cell” of information sourcing doesn’t have an entrée to Mueller. Mueller is instead focusing on a money-laundering case from 2005, which has no relation whatsoever to the allegations about 2016. It does, however, have some connection (regarding its facts about Manafort’s activities and Ukraine) to a group of later actions by Manafort, falling between 2007 and 2014, on which the FBI received information from the media in April 2017, and was thus prompted to raid a Manafort storage locker. The source of that information was probably the network of a Hillary Clinton associate, Alexandra Chalupa, who – separately from the Steele dossier – had been fanning the narrative about Manafort and Ukraine since 2016. But the history of months-long importunities from Steele in 2017 indicates that he, unlike the purveyors of the Alexandra Chalupa information, was unable to have his data points injected into the Mueller process. There are three aspects of interest in that. One is, again, that Mueller has resisted the overtures from the Steele cell. Another is that the Steele cell desperately wanted to get a foot in the door on Mueller’s investigation. It wanted to be able to influence the probe’s focus by supplying information that would shape it. 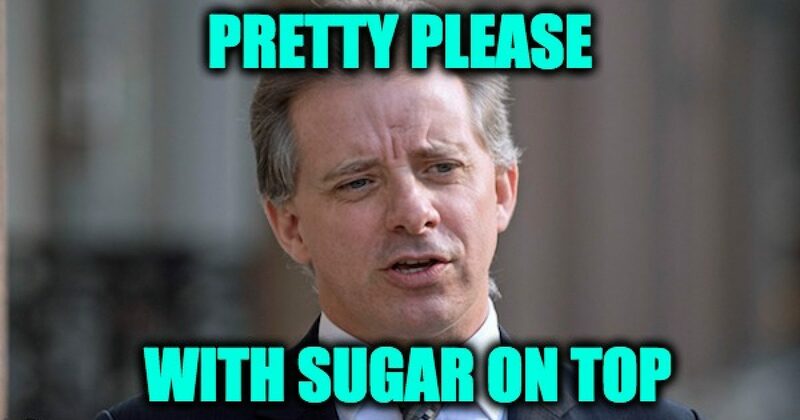 Steele’s own words make that clear. But Steele is just the front man. He was being paid by others to be so highly motivated. But the third is actually a meta-narrative dimension, and it’s this: there has all along been more than one avenue of what we might call “information injection” about the Russia-Trump narrative. And it appears to involve different sets of people. The Steele cell laid the foundation for a FISA warrant on Carter Page in 2016. But it couldn’t get back in the game once the Russia-Trump nexus shifted to Mueller in mid-2017. Nevertheless, Mueller was willing to have his Manafort case associated with material from a separate sourcing thread (the Chalupa-centered information on Manafort and Ukraine) that also came from 2016, and was also connected intimately with the election fight and Hillary Clinton. There are, also, the legally futile but persistent markers Mueller has been laying down on Russian Internet activity and the ID fraud and money laundering connected with it. That he is even going through the motions on this suggests a separate motive beyond merely beefing up his indictments record. The motive may or may not originate with Mueller and his investigative strategy. In fact, that may be said about all the decisions on focus and information sourcing for the probe. But the motive to foster an impression of outsize Russian impact on the 2016 election, through the use of the Internet, appears to be a uniquely strong one. It is disproportionate, at the very least, to the legal utility of the effort. Does that motive have an identifiable source like the Steele thread and the Chalupa thread? It’s a good question. But the real mental adjustment is recognizing that there are different threads, and probably different sets of actors behind them. Steele’s unsuccessful effort to get back in, in 2017, has thrown that into sharp relief for the first time. The Mueller investigation has been justifiably seen from the beginning as a means not just of affecting Donald Trump, but of deciding the course of America’s future, and hence the world’s. Whether it lives up to that potential, it has that potential. Failure by the probe to make headway against “Trump” – the political phenomenon – would be as decisive as a success. Either way, shaping it and controlling how it fights, and for what is paramount. It has thus been probable all along, that the Mueller probe would be a line of confrontation for the various interests that now prey on consensual governance throughout the world, from bribe-laden foreign lobbies to business interests to politicized news media and self-appointed keepers of “civil society” (that is, specially motivated, deep-pocketed donor networks) like the non-profits of George Soros. Steele’s unsuccessful bid to get into Mueller’s game, after being in the FBI’s for years, is a rare glimpse demonstrating that the probable is actual.